Road Safety Week (23 to 29 November) begins today and South Gloucestershire Council’s road safety team are taking the opportunity to remind people to ‘Be Safe Be Seen’. Road safety officers have been working across South Gloucestershire to raise the awareness of cycle safety to cyclists, drivers and pedestrians. 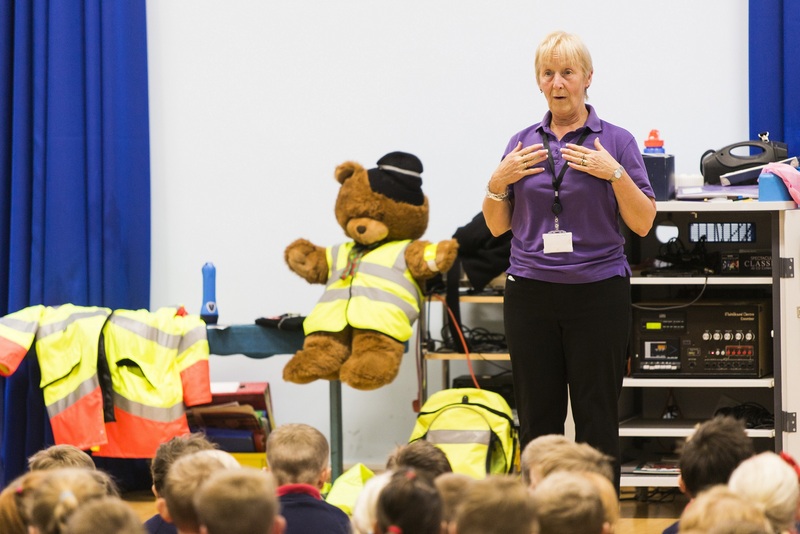 As part of this, the team have been visiting primary schools over recent months to present their annual Be Safe Be Seen assemblies to pupils where they highlight the importance of being visible to others when out walking or travelling on our roads. This year officers have visited 64 schools and a total of 14812 children have taken part in the assemblies. The road safety team have also been visiting large employers in the district including Rolls Royce, the MoD, Airbus and GKN to promote adult cycling and ensure cyclists are safe and can be seen by other road users. The road safety team work alongside the Travelwest roadshow and the Institute of Advanced Motorists to offer information and advice to staff on how to travel safely. Road safety officer Pam Williams said: “Always make sure you can easily be seen by other road users before you set off on your journey. Pedestrians are advised to wear clothing and accessories incorporating reflective and fluorescent materials at dawn and dusk, in the evening, and in rainy or foggy conditions. “Cyclists should plan ahead for when the weather freezes and to always use lights after dark or when visibility is poor. Wear light coloured or reflective clothing during the day and reflective clothing and/or accessories in the dark to increase your visibility. “With regards to motorists, drivers are advised to clear snow and ice from all windows and mirrors before setting off to ensure good visibility. It will take you 10 times longer to stop in ice and slush than on a dry road, so in those conditions slow down, manoeuvre gently and avoid sudden braking or acceleration. Tyres should have plenty of tread and be at the right pressure and check that your brakes and lights are working correctly.